People wearing crocs. The flowers are accessories. 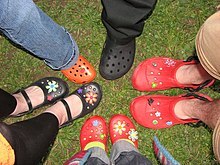 Crocs are a type of plastic clogs. They have holes in the top of them so your feet can let in air. They also come in many different colours. You can buy different accessories to clip into the holes of the shoe. The company who make them was founded in 2002 in Colorado. This page was last changed on 22 November 2014, at 17:27.